This tastes as nice as ever and serves a lot of people, what more can we say … Serve with baked potatoes, cheese, sour cream, mashed avocado, tortilla chips, rice or any combination of these. Try and make it a day in advance if you have time – it’s even better on day two. Heat the oil in a large flameproof casserole over a medium heat. Add the onion and star anise and cook, stirring, for 3-4 minutes or until soft. Add the garlic and green chilli and cook for about 30 seconds or until you can smell them. Add the beef and cook, breaking up the lumps with a spoon, for about 5 minutes or until is is browned. Add the tomato paste and spices and cook for another couple of minutes. Pour in the wine, bring to a simmer, then cook for about 6 minutes or until the wine has reduced by half. Add the Worcestershire sauce, stock and tomato, then season well. Bring to the boil then cover with a lid and transfer to the oven. 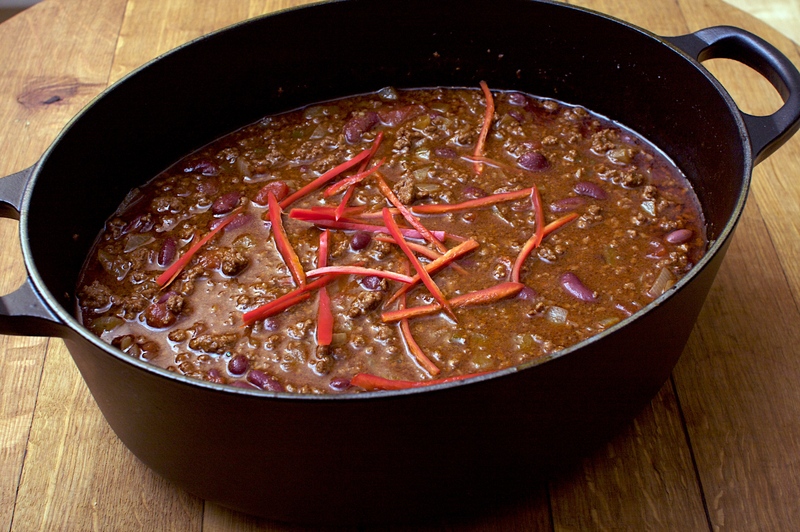 Bake for an hour or until the chilli is reduced and thick. Stir in the kidney beans and top with shredded chilli to serve. Wine Suggestion: Something youthful with some juicy fruit that won’t get clobbered by the chilli. We went for an 07 Manium Bierzo from Spain, suggested by Chris from The Corkscrew on Chatham Street, which was an excellent choice and good value at €14.95.